Jesse James is a custom bike and car builder, producer, publisher, television host and restaurateur. In 2000, James started his TV career with Discovery Channel’s Motorcycle Mania, and in 2002 produced and starred in the international television hit Monster Garage. However, before he was a TV star with multiple shows, including a third-place finish on Celebrity Apprentice in 2009, Jesse founded West Coast Choppers. Arguably, this is the enterprise for which he is best known. His shop is the reason for his discovery, but his skills and work ethic are why his success has been maintained for so many years. Because he is an expert welder, Jesse produces only a dozen or so bikes a year, making for a very long wait list to commission one of his coveted custom machines. Jesse James and BendPak first forged a business relationship in 2000 following the Discovery Channel documentary Motorcycle Mania. 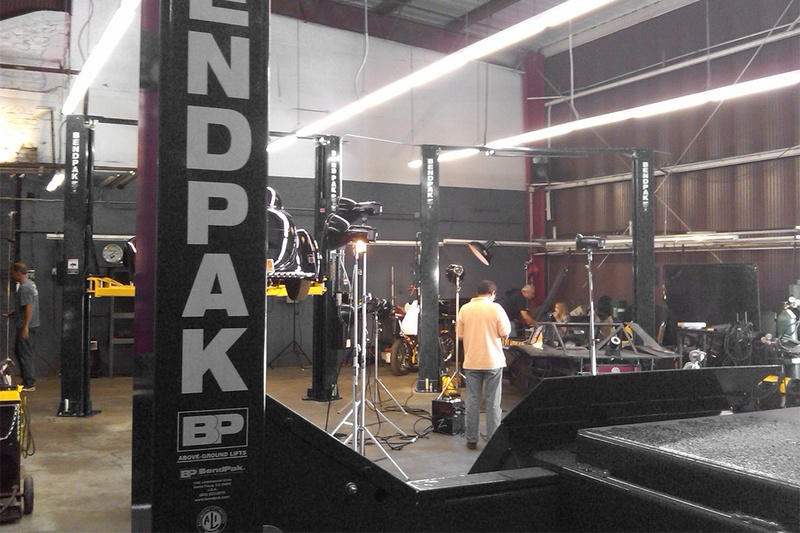 BendPak approached James about selling a Ranger specialty motorcycle lift under the West Coast Choppers label. The deal never went through, but when Jesse James became involved with the groundbreaking series Monster Garage, BendPak / Ranger provided a four-post lift and other shop equipment for the 2003 production. 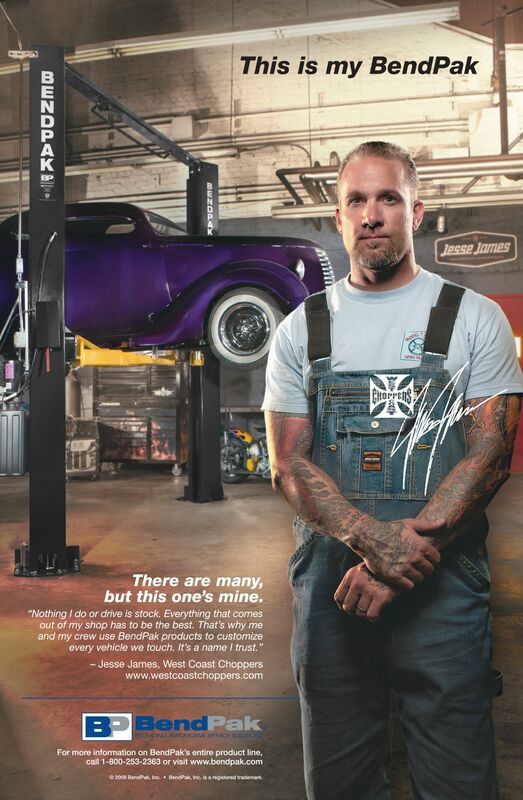 Since then, Jesse James has been using BendPak equipment to assist in his custom builds, both on television and at his Long Beach-based West Coast Choppers. Never one to settle on a single project or set his sights low, Jesse established his own production company, Payupsucker Productions, and in 2004, he became publisher of Garage Magazine and launched Payupsucker Publications. In 2007, he launched a new clothing line, Jesse James Industrial Workwear. At the end of the day, Jesse is one heck of an entrepreneur. When it comes to classic car restorations, motorcycle builds or even custom firearms, if it's made of metal, Jesse is arguably the most accomplished craftsman in the nation. The photo shoot for Jesse's "This is my BendPak" ad (featured below) took place in 2009 in James’s own West Coast Choppers garage in Long Beach. 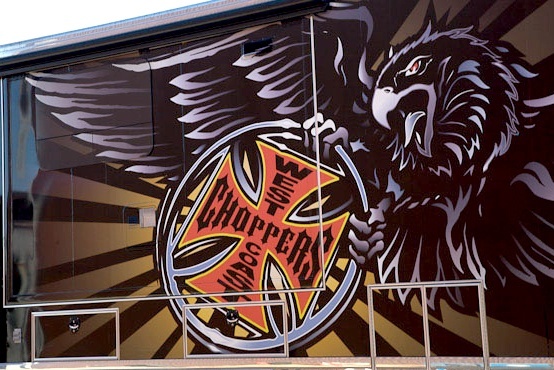 Although West Coast Choppers features a beautiful on-site showroom, Jesse James insisted that he be photographed in the garage where he actually works. The ad first ran in several popular automotive magazines in 2010. A guy’s garage says a lot about who he is. Jesse’s shop is a pretty no-nonsense setup, but he still keeps a lot of authentic nostalgia kicking around. That kind of energy really comes through in the ad.